Anderson Japanese Gardens located in Rockford, Illinois has been a project of continual growth and excellence since its inception in 1978. What began as collaboration between founder businessman John R. Anderson and renowned master craftsman and designer Hoichi Kurisu of Kurisu International, has grown to over 14 acres of peace and serenity. Located on Spring Creek near where it empties into the Rock River, just over two miles from downtown, visitors to the garden can soon forget they are literally surrounded by the city. In the late 90s, the decision was made to build a reflection pond in a large open area that had been set aside for public gatherings with water diverted from Spring Creek. The Garden of Reflection Pond as designed covers approximately a half-acre with a maximum pool depth of nine feet. Situated in Northern Illinois’ glacially scrubbed geology of thin topsoil over sandstone bedrock, it soon became apparent an impervious liner of some sort was to be an absolute necessity. The difficult site conditions were also compounded by the high ground water table found along the creek. The downside to the moderately priced reinforced PCC option would be the PCC curb that would be needed around the entire parameter of the pond. Gruner pointed out, “the vertical face of this manmade material delineating the entire shoreline would be a major distraction in a garden setting made entirely of all natural and organic materials.” A secondary concern was the inability of the PCC to handle the thermal stresses of a U.S. Midwest winter without cracking and causing major leaks. Asphalt is a naturally occurring material, found in surface deposits all over the world and its history as a waterproofing material has been well documented. Original uses include coating baskets to prevent water from leaking out and to caulk boats to keep water from leaking in. Archeological excavations have found evidence that asphalt has been used to line temple baths and water tanks dating back almost five millennia. Evidence also shows that ancient engineers used burnt bricks set in an asphalt mortar to construct canals, levees and even tunnels to control and divert the flow of water. In more modern times, IACLs have been used for decades to line reservoirs (some with capacities in excess of 82,000 acre-ft. of capacity) that are used for power generation, drinking water storage and fish hatcheries. After excavating the pond footprint and contours, eight inches of well-graded and compacted crushed limestone was placed along the bottom and up the slopes of the new pond. With the ground-water elevation 4-feet higher than the planned bottom elevation of the main pool, rupturing of the IACL would be a major issue whenever the water level in the pond needed to be lowered. To avoid this build-up of hydraulic pressure, an underdrain system of tile was installed and covered over with two feet of free draining clean, washed limestone chips. The drainage layer and grid system collected the ground water and drained it into sump that had a depth of 16 feet and was 30 feet west of the pond. This dual system of porous drainage layer and drain-tile also has the potential to capture any leakage from the pond and drain it to the sump. A submersible pump and valving arrangement returns the captured water in the sump back to the pond or diverts it back into the creek as needed to control both the level of water in the pond as well as the level of groundwater under the pond. To keep the surface of the pond clear of leaves and other floating debris a series of twelve commercial pool-type skimmers were strategically built into the shoreline. Surface water flows into the skimmers, which traps the debris, and then into a series of pipes that ring the pond. From here, the water drains into the same sump, where it can be pumped back to the pond. In late fall after the garden closes to the public for the season, the pond’s water level is dropped to an elevation approximately ten inches below the bottom of the skimmer openings to prevent damage from freezing. As a precaution, once the paving was completed, and prior to the start of finished landscaping, the pond was filled nearly to capacity and then monitored for a period of time to test the integrity of the IACL. Once the IACL passed this important test, the pond level was then lowered to an elevation well below the wetlands area of the perimeter and landscaping commenced. With the addition of the Garden of Reflection Pond, the scenery and views at the Anderson Japanese Garden have become overwhelmingly breathtaking. 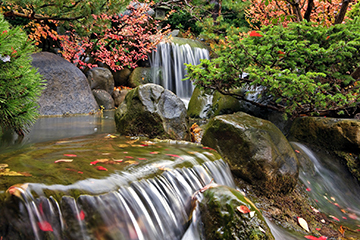 So much so, that in 2004 and 2008 the garden was named the highest quality Japanese garden in North America by the Roth Journal of Japanese Gardening. Not to mention, unobtrusive. With the mature landscaping and boulders now surrounding the pond, and beautiful koi calling the pond their aquatic home visitors today will have a very difficult time trying to find any signs of the IACL. Or for that matter, any other uses of asphalt, anywhere on the garden grounds. In fact, the only place where I found any significant exposed asphalt mix was the wearing surface on a small footbridge over a tiny stream. Wayne Jones is an Asphalt Institute Senior Regional Engineer based in Ohio.